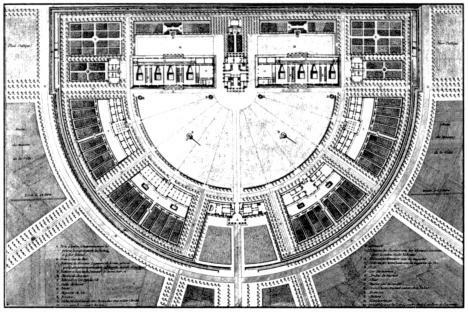 For some reason, however, when I first heard of Starke, I immediately thought of Claude-Nicolas Ledoux’s 18th century plans for the royal saltworks at Chaux, in Arc-et-Senans, France. 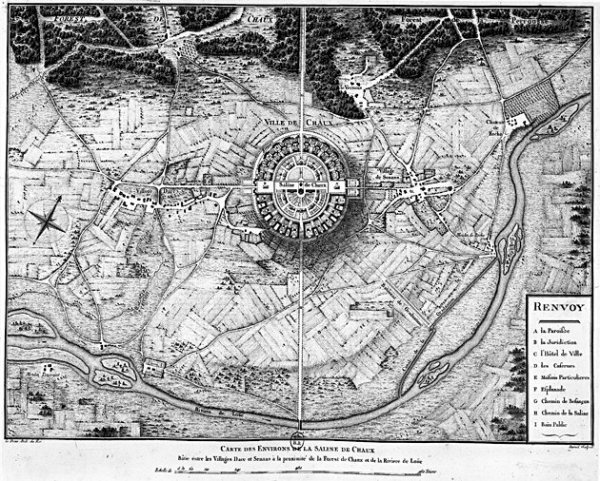 Chaux may not have been a prison, but it was a quasi-utopian (read: radial) community of workers, each of whom had their own assigned home and workspace. The whole thing was overseen by what was in effect a plantation master. With all the workers living on-site, the community formed a kind of early industrial “factory town,” a total-living experience – that, for some reason, seems oddly like Starke. Maybe not. 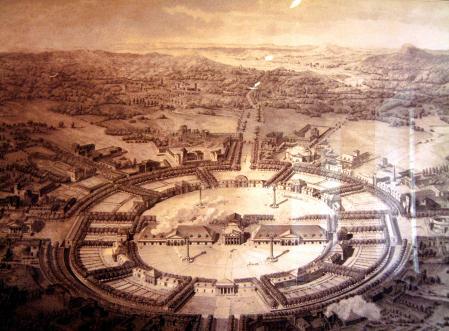 [Image: Ledoux’s saltwork utopia, from Gallica]. (Via Archinect‘s own live-in avant-garde, Bryan Finoki). really easy joke, but isn’t this town called Celebration? Wow, amazing that you found the part of that post that I never wrote and that doesn’t appear anywhere on this site in which I claim that the prisoners are all great people. Good reading skills! If you’re referring to FSP (Florida State Prison), it’s maybe 6 miles outside of Starke on SR-16. US301 runs through Starke, and there are no checkpoints. FSP is the ONLY prison in florida that executes death row inmates. Camera crews are regularly alowed to film, and the Department has a fairly decent PR dept that will clear almost any reputable news organization for interviews of prison officials. There is a state owned trailer park, and 20 ‘actual’ houses for staff housing, not even .1% of Starkes available residences. i’ve lived in raiford.on base, my grandfather worked at the prison,i can remember the inmates doing the yard work..i also remember the cantene ,and the ten oclock curfew van coming around the base to insure all’s safety. RAIFORD PRISON, HOW I HATE THE PLACE, AND YES AS ONE OF YOU SAID IF THEY WERE SUCH GOOD PEOPLE WOULD THEY BE THERE? WELL YES AND NO. THE FATHER OF MY CHILD IS ON DEATH ROW THERE. AND HE TOOK THE FALL FOR HIS SON. HE WILL BE PUT TO DEATH FOR A MURDER HE NEVER DID. AND GOING THERE TO VISIT IS A DRAIN YOU JUST CAN’T PUT INTO WORDS. AS FAR AS OTHER MEN ON THE ROW SOME WHO SHOULD BE THERE ARE MONSTERS LET ME TELL YOU. MEETING TED BUNDY MADE ME SICK. YOU SEE THINGS AND HEAR THINGS YOU WISH YOU NEVER HAD. IF YOU ONLY KNEW THE HALF OF IT. BUT THEY DO MAKE MISTAKES, LIKE THAT OF A MAN THEY PUT IN THE CHAIR IT TOOK THREE TIMES TO ZAP HIM BEFORE HE CAUGHT ON FIRE AND DIED LATER THEY FOUND HIM NOT GUILTY. HOW SAD FOR JESSIE THAT WAS HIS NAME. NO ONE KNOWS ANYTHING UNLESS THEY GO THERE! AND IT IS HELL ON EARTH.